Fun local news to share! 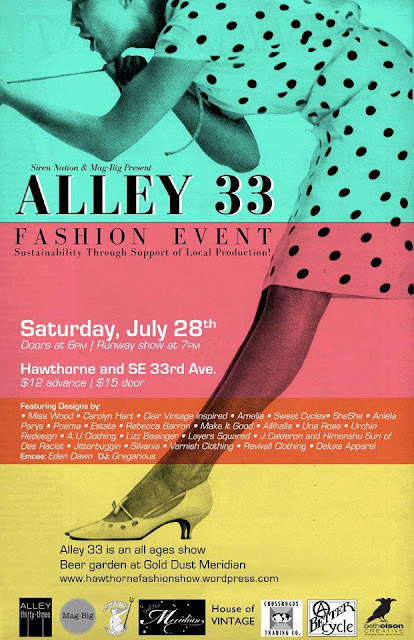 The Alley 33 Fashion Event, an annual fashion show showcasing local Portland designers, is coming up a week from today and yours truly will be modeling in it! This is so awesome!! I had no idea you were in Portland! I live in Salem so we are very close! I'm sure that will be tons of fun! Cool, great to hear from another Oregonian! Hope to see you at a Portland Bloggers event sometime soon! I'll be posting about them so watch for updates... next one is August 26th! I am so excited for you! Wish I could be there! That's amazing!! I can't wait to hear all about it and see pics! Would be so fun to meet you!